She sighed thankful that today was not a school day. Walking thru town with her arms full with a basket of flowers she shook her head wondering how her insane father ropped her into doing something like this. He would have her arrange the flowers, and take them out to the buyer when the calls came in. Sakura Hitsugaya neice of Toshiro Hitsugaya according to her father the fabled gaurdian dragon of the heavens...which she had a hard time blieving since she had never even met a Shinigami let alone her own Uncle. Something about them not really on speaking terms at the moment. Then there was the fact that her father always seemed a bit nervous about her having white robes instead of black he said it was because she had a mask. None of that was a concern of hers at the moment....just getting these flowers to..
"78295 Jushiro row..." She murmmered as she walked along Then yelped and blinked when she heard a whooshing sound a sword swinging and looked over at the man praticing and she blinked....was that...a Zanpakuto? Was he a Shinigami and if he was....then was her father telling her the truth about her being a Shinseina whatever the heck that was? Sakura had been about to answer then blinked and froze as the spirit appeared....just like Zakurakadoguchi could. She looked at them as they argued. "Go for..." She asked puzzled not sure what it was that they were talking about or what this playing entitled but it was making her uneasy the way the scantly clad spirit was sauntering up towards her. "Um....hello?" She said softly as she shifted her grip on the basket of flowers not sure she wanted to be here right now. Zakurakadoguchi's warning wasn't helping her any as she looked at the spirit walking towards her, nor was the fact that if she didn't want to play with the spirit he was going to fight her? What excatly had she done other then pausing to watch him a moment training startled to see a Shinigami for the first time since her father who claimed her was one never transformed infornt of her...although he did make her train an awful lot. Benishihone got right infront of her with a smile on her face then she said... "Hello..... im Benishihone.... dont mind Ryo he's a little high strung he's unrivaled in the spirit world..... he doesnt want to kill you if thats what your wondering he just wants a powerful opponent and when he felt your spirit pressure you peaked his interest..." She giggled and pushed her breast up against Sakuras breast and said... "But dont worry if you play with me he wont lay a finger on you...." She took Sakuras hand knowing she had peaked Sakuras interest if only a little, it was obvious the spirit was bi-sexual and was trying to hint at the young woman but what was Ryo gonna do? Sakura stared at the woman before her blushing bright red when she pressed her chest against hers, taking a half a step back. "Oh..." she said puzzled and glancing over at Ryo who was....about to take a nap? She looked back at the girl before her....as flattering as it was..."I'm...sorry I really don't have time to play right now.." she said softly hodlign up the basket. "I have to get this delivery made." She took another half step backwards highly unnerved by how very forward this spirit was being. "It's nice to meet you Benishihone.... I'm Sakura Hitsugaya." She said having no idea that her father wasn't a loon and that her Uncle was indeed a Captian in the Gotei thirteen....and techniquelly the same age as her. 'Zakurakadoguchi?' She thought looking at the other. Zakurakadoguchi's tone made Sakura blush that much more. "I really should be going now...sorry for the trouble Benishihone." She said softly. Sakura blinked when he turned out to be the one she was delivering the flowers to. Surprised as he confirmed everything she took a deep breath and turned her attention back to the girl before her yelping when she was once again being 'assulted' by the spirit. Blushing bright red she quickly stepped away shaking her head heart racing a mile a minute. "I....I have to go." She said flustered and turning to leave. She really didn't want to play this game with her. Sakura started to walk away wanting to put some distance between herself and Benishihone not at all happy about the fact that her body had started to respond to the touch even if she was certain it wasn't one she particualy wanted. Sakura wasn't happy about the fact her body seemed to be disobeying her orders as the other was kissing and manhandling her, she brought her hands up around the other as she suddenly had a physcal form and then shoved back hard her Reiatsu raising up as the ground began to frost and ice over, the air taking on a frigid chill. "N...no." She said narrowing her eyes. "I'm not just a plaything you can use." She snapped unaware that she was sounding very very much like Toshiro...on a good day. Her icy eyes narrowed as she began to walk away again from Benishihone not wanting to be be caught up in this anymore. "Just because your making my body respond doesn't mean I want it." she said in an icy tone. And she didn't, she was a normal healthy teenage girl...well minus the fact that she was born half dead, and had powers that normal teenagers didn't have. "Find someone else to play with." She said icily as she started back the way she had come. Sakura closed her eyes as the spell was cast and felt herself slipping back as her other 'half' showed herself. Slowly opening her eyes which where black aroudn the pupils and glowing silver discs the mask unable to form while she was in her human body or gi-gai she looked at her. "You're right, the King was trying to hide something..." She said in a cool cold tone. "[color=green]But it's certainly not what your thinking[/color]." Her fingers tensed and dug in even as she smirked her voice a dark velvetine purr as she looked at the spirit before her. "You really shouldn't have tampered with the Kings balance...I don't play anywhere as nice as her." Description: When he uses this attack he is already in his Bankai he and his zanpaktou spirit cross their swords and slice their opponent together creating a blast of cool and hot burns. Shiori shook her head, although she was boring Sakura's body she slide it from the human state to that of bankai and flash stepped right out of the way of the attack. The mask in place she shook her head making a tisking sound. "Too bad you should have taken no for an answer." She said shaking her head and narrowing her glowing eyes. She tossed the blue black blade up in the air and caught the chain her her hand whipping the sword around in a whirlwind like motion next to her. "Going to have to kill you now before you damage king." she said annoyed and glared at them both. She needed the girl alive not dead. Shiori moved to attack, throwing the sword forward while holding onto nothing more then the weighted chain, right at them, ice and snow falling from the sword even as it flew forwards to be yanked back just as fast before repeating the process. Sakura grit her teeth. "Show yourself!" She shouted and thru her fan's disrupting the snow around her before narrowing her eyes and chasing after the solid white image of herself. Shiori was ahead of her having fun and laughing at her as she made her way towards her. That Zanpakuto had brought Shiori to the surface and she had worked so very hard at defeating her too....figures she'd have to deal with this now. Shiori was not happy as she was being driven back towards the ground bracing herself as she slide looking up at the guy with wild laughter and crazy attack. She moved managed to get out from underneath his attack and looked up at him sword in hand as she slid backwards. "Huh have no choice then.." She smirked and moved fowards fast bringing her sword around hard and fast to take him out. Sakura grit her teeth as she arrived to the place that Shiori was standing in and they began fighting unware that at the moment Shiori was also fighting against Ryo. Anyway she looked at it she needed to regain control over her body and the situation at hand. The battle between Shiori and Sakura ended as it always did in time for her to hear his words as the mask was still in place. "Souten ni Zase..." She answered him breathing lowly as he pushed his sword up against her throat burning her a little. "Kurogane...Zakurakadoguchi." The attack was point blank ripping off of her sword to hit him as the great ice dragon formed cherry blossom petals whirlwinding around them both. "I'm not just a pretty face." She retorted the moment the attack went off. Even as she was pinned beneath him. She was a Hitsugaya and according to her father they didn't go down without a fight. She was no different. Special Abilities: When she releases it's power the petals swarm the enemy as a dragon's roar can be heard before it seems to suddenly appear from the frozen air and swarm the enemy capable of freezing the enemy, ground and everything it touchs while the cherry blossoms shatter and cover the person in ice. As the cold ice nipped around him he grinned he had a real interest in this young girl and not just battle wise something about her confident eyes excited him almost as if he was looking into the eyes of the woman he was destined to be with but for now.... "Heh care to prove that..." He grinned as he jumped backwards away from the attack his hair wild from the excitement he knew he was right when he noticed her spiritual pressure she would be one of his greatest battles if she survived long enough.... He brung down his blade and cut her arm then he sweep kicked her and rolled over on top of her and completely subdued her it was now almost impossible to escape him now... "C'mon girl what happened to all that amazing strength you just had?" He let his breath linger on her as his face turned red though he would probably never admit it..... he was developing a 'thing' for her?? Sakura pressed one hand into the ground before her Reiryoku spiked around them, both her shinigami's reiatsu and her hollow's reiatsu combining as she pushed up sending them both into the air and flipping around seemingly, have left her sword on the ground forgotten even as she twisted as a high speed and then her sword was in her hand with a flick of her wrist and she was slashing across his stomach. Not to have seemingly noticed the cut along her arm as she looked at him. Then flickered and appeared behind him, it was her turn to drive him into submission. "You where saying?" She said as she held him down sword against his thoart her Reiryoku still intermixed as she narrowed her eyes at him. The confindence was still there. As as she held him down. Power Augmentation: With the acquisition of the mask through the subjugation of one's inner Hollow, Vizard gain access to an additional and separate source of power - aside from the Shinigami powers they already possess - Hollow powers. The accumulation of both powers greatly augments their powers beyond what a Shinigami and/or Hollow alone would be capable of. Mask Protection: Body damage can seemingly be ignored while wearing their masks, as demonstrated by Ichigo's Hollow during his unwilling transformations. Reiryoku Enhancement: Vizard have dual spiritual power of both Shinigami and Hollow, which enhances their abilities. 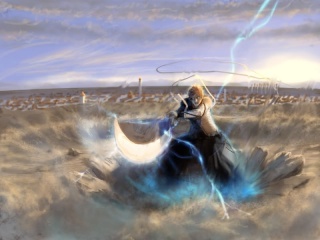 Telekinesis: Vizard apparently hold varying degrees of telekinesis; For example, Ichigo, in his new Hollowfied form, has employed this ability to call forth his Zanpakutō with a mere flick of the wrist. Speed enhancment~ The mask allows her to move at much faster speeds then a hollow or Shinigami can achieve on there own. Effect: The ability to channel Reiatsu thru her body allowing her to repel off of spirit waves or the ground at high speeds, allowing for quicker mobility and getting between an escaping enemy or not. Sakura wasn't sure of what to make of his strange behaviour. She narrowed her eyes as she reached up and sent away her hollows mask, having been kissed by him to boot! She stood there in her bankai and shook her head. "Who are you?" She asked looking at his retreating figure still holding her sword in hand. So far the fight seemed to be over, but she sincerely hoped his blade's spirit didn't decide on round two. She reached up a moment and pressed her free fingers to her lips then shook her head as if to shake it off. Sakura smiled at him and nodded. "I'll remember." She said stepping down. "I know I told Miss Benishihone, however my name is, Sakura Hitsugaya, I'm a Substitue Shinigami Shinseina." She said as she released bankai and was in her normal white shinigami attire. She looked at him and turned getting ready to head back. "It was nice to meet you Ryo Zaran." She said in a sweet tone intending to head back to the flower shop.